Fewer cars are closer to the apex of technological change than the new Honda NSX. Coming 27 years after the Ayrton Senna-developed original gave Ferrari and the supercar establishment a bloody nose, the new car is as much a nod to its grandfather as it is a leap into the future. At the heart of what makes the new NSX a significant milestone in the evolution of the motorcar is its drive train. The 3.5-litre, twin-turbocharged V6 is mated to not one, but three electric motors and a battery pack which recharges when you brake. The motors only hand out an extra 73 horsepower, but it is deployed tactically to hide any moments of lag from the 500-horsepower petrol engine. It might seem unnecessary to add complexity (and hundreds of kilograms of it, at that) when 500 is 'only' increased to 573, but to question Honda's motive here is to miss the point. The NSX is proof that the hybrid supercar concept works and is not just a glimpse at the future, but a meaningful step towards it. In many ways, the new NSX is a tale of two halves. On one hand it is a brutally fast mid-engined, two-seat supercar, but on the other it is one which weighs 1,776kg (400kg more than the equivalent McLaren), and much of that bulk is responsible for serving up the seemingly tepid 73hp of electrical assistance. 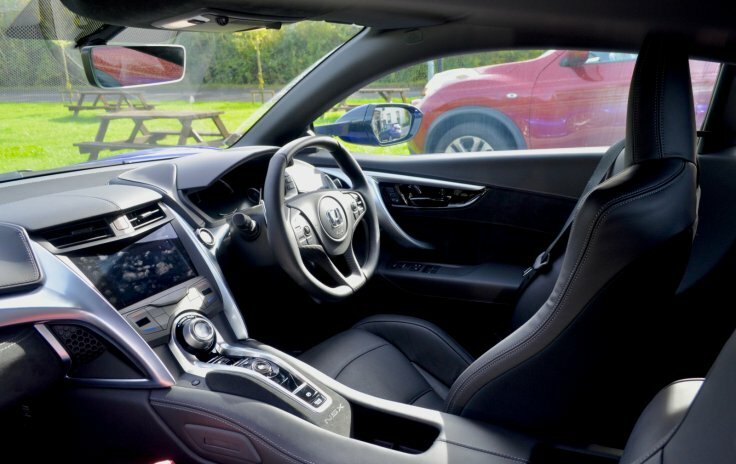 It is also a Â£144,000 supercar, but one which has a dashboard covered in plastic instead of metal and carbon, a lacklustre infotainment system and a frustrating set of pre-programmed driving settings which don't let you mix-and-match, to pick a louder exhaust and more direct steering with softer suspension, for example. Setting off into a wet and miserable autumnal morning, we took the NSX away from its UK launch in search of some much-needed answers. Immediately our technology side was turned on by how the NSX can drive almost entirely without its engine. Being gentle with the throttle sees the car rely solely on its three electric motors, giving the surreal experience of piloting a low-slung supercar through a town in complete silence and with the rev counter resting at zero. It's a cool trick and earns the NSX the right to be described as a miniature version of the Porsche 918 million-pound hybrid hypercar. But you aren't here to read about how the NSX is silent in town and kind to the environment. So let's move out of Quiet mode, skip Sport and jump straight into Sport+. Here the throttle is sharpened, steering given extra weight (although being electric it still feels numb), gear changes quickened and more sound is pumped from the engine bay into the cockpit. The latter is real noise sent through tubes, by the way, not augmented sounds coming from the stereo speakers, as with the BMW i8. Switch the gearbox from automatic to manual, pull the left paddle to drop a few cogs (or a lot if you happen to be cruising in ninth. Yes, ninth! ), and bury your right foot. The greasy roads and cold tyres catch out the four-wheel-drive system momentarily before traction is restored and the NSX charges down the road. The industrial sound of the engine sucking in air and belching it out through the turbo waste gates between gear changes is dramatic but not musical. It is also at odds with the near-silent battery tech, which acts like one of London's electric DLR trains helping out the Flying Scotsman. 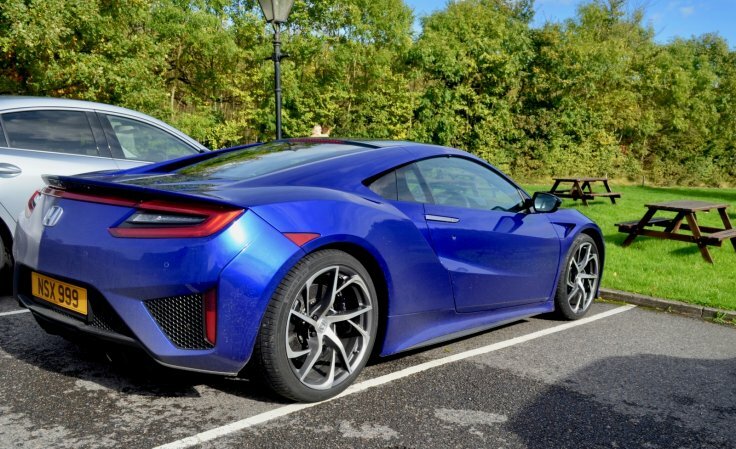 The battery, which recharges when you brake, helps to provide instant torque from low down in the rev range, eliminating turbo lag and giving the NSX an uncanny pulling ability in any gear. The engine is still the star of the show, but the electrical assistance does a fine job of both hiding its own weight and delivering the instant, surging and unrelenting acceleration electric cars are renowned for. Honda claims a 0-62mph (100km/h) time of "under three seconds" and a top speed of 191mph, so on paper at least it is a proper supercar with performance to match the new Audi R8 and McLaren 570S. A nine-speed dual-clutch gearbox with short ratios means you need to change gear a lot to keep the engine on song. But while that sounds like too much effort you quickly realise anything beyond half way through fourth gear is illegal just about everywhere. Flicking between second and third while threading the NSX along a sweeping country lane is an absolute joy, the technology somehow hiding itself to the extent that you never really know or care how much the electric motors are working. And although it feels completely natural, the complex hybrid drive train also helps when you get to a corner. The two front motors can increase or reduce the amount of power sent to each of the front wheels, known as dynamic torque vectoring, to help the car turn in tighter and eliminate understeer. Sticking with the electric theme, the NSX's steering, throttle and brake pedal are all fly-by-wire, meaning there is no direct, physical connection between the controls and what they operate. This is fine for the accelerator, but the steering doesn't provide much feedback and electric braking is something we approached with caution. It doesn't take long for these doubts to evaporate, as the feel transmitted from the optional (Â£8,400) carbon ceramic brakes to the pedal, via a computer, is natural and confidence inspiring â€“ at least for brakes with a character-altering energy recovery system. Less impressive are the gear shift paddles, which are plastic and loudly click-clack as if they have come from a PlayStation steering wheel. It's a shame they aren't made from aluminium or carbon fibre and sadly the rest of the interior suffers from the same overuse of plastic. The silver panels across the dashboard are all plastic and, despite this particular car's Â£2,300 interior carbon pack, it doesn't impress as much as the fully-loaded Â£174,250 price would have you believe. Speaking of optional extras, this car has every single one apart from a carbon rear spoiler. The rest includes special paint (Â£4,800), carbon fibre exterior pack (Â£7,100), carbon fibre engine cover and bay panels (Â£2,900), carbon brake discs and red calipers (Â£8,400), an uprated Garmin sat-nav with CD and front/rear parking sensors (Â£1,700), power-adjusted heated seats (Â£2,000), black Alcantara headlining (Â£1,100) and the aforementioned interior carbon pack. That means Â£30,300 of extras on top of the Â£143,950 basic price, yet Honda claims the majority of buyers so far have ordered almost everything. 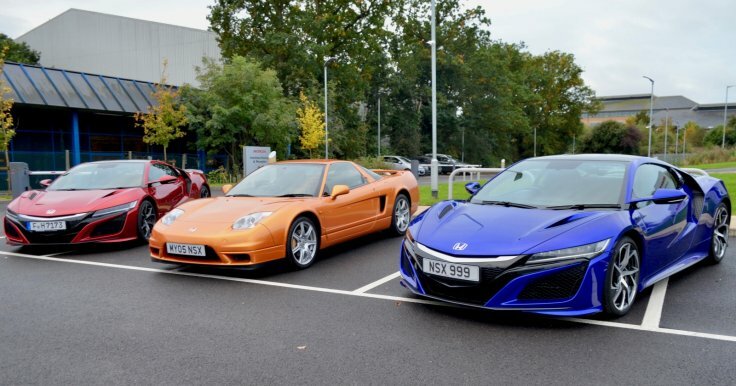 Honda has shown remarkable restraint with the NSX. It could have taken the BMW i8 route and emphasised the car's green credentials with narrower tyres, blue details and unrealistic claims about its economy. Instead, it uses the battery and electric motors to produce a more thrilling drive. 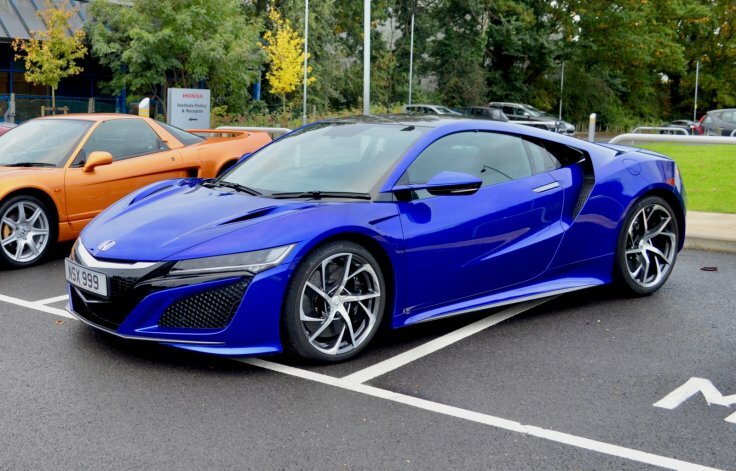 Quiet mode will cut the engine and make the NSX act like a environmentally conscious Toyota Prius, but in Sport and Track modes it feels like a proper junior supercar with an electric drive train which not only disguises its own weight, but also hides any gaps in the performance of the engine itself. Interior materials and storage could be better, and the options list can get frighteningly expensive in a way best reserved for Italian marques. 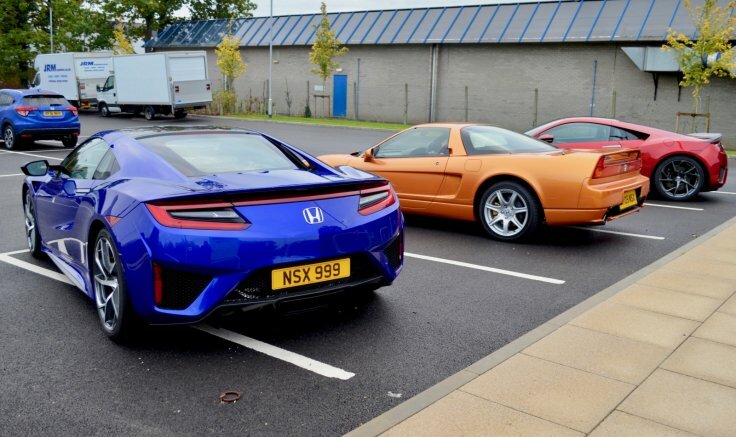 But the NSX looks incredible, is huge fun to drive, will likely remain exclusive throughout its life, and, just like the 1989 original, makes supercar thrills accessible for the masses.